The track is divided into sections that allow testing of the machines in different conditions. The track has significantly improved the quality and efficiency of Logset’s machine testing process. “The new test drive track is a brilliant solution. Our final inspection Eengineers and the product development department are all very excited. Now we can better test and adjust the machines before they are delivered to our customers,” Technical Director Jukka Kivipelto said. The test drive track consists of six different sections: a straight part for acceleration, speed and deceleration, slopes for traction and changes in load conditions, a calibration and sawing area for harvesters where the harvester head is calibrated by feeding and sawing logs, a loading area for testing and adjusting the crane, and a bounce track for cabin suspension and levelling. 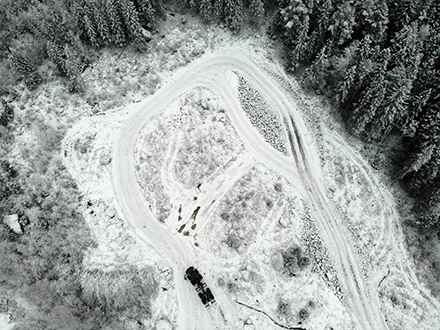 In the past, Logset test drivers used a shorter test drive track, after which the machines had to be taken to the forest for further field tests. “Now we have our own closed test drive track, where we can do all the necessary tests. We can even train our customers to drive on the track or use it to showcase different machine features,” Mr Kivipelto said.